You may wonder if the full moon party is held on many beaches when travel to Thailand but no, the most famous and attractive is actually in Koh Phangan island. 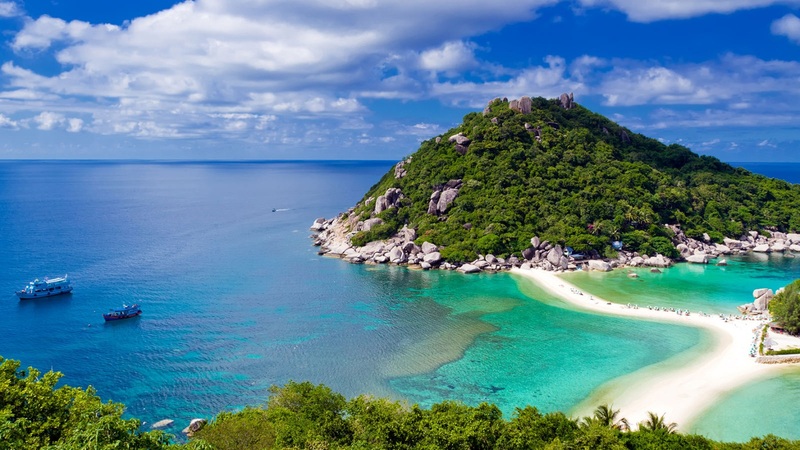 Koh Phangan island, with the total area of nearly 170 square kilometers, is the fifth biggest island in Thailand. Koh Phangan Full Moon Party has become a world-famous institution, but its ancestral home remains the crescent cove of Haad Rin Beach on the southernmost tip of Phangan Island in Thailand. 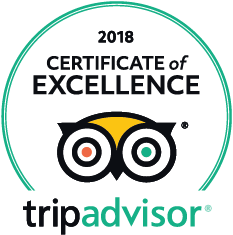 Besides the lovely and unspoiled beachfront area, once a month, Koh Phangan offers you a chance to experience the craziest party with numerous of powerful sound systems which turn the coastline to the huge open-air nightclub. This one-in-a-million event is routinely listed on bucket lists as one of the essential experiences in Thailand which absolutely is for young and party people. Are you excited already? Yeah, I know, but first, we need to figure out how to get there. Located only around 12 km from Koh Samui, Koh Phangan can be accessed by boat/ferries. There are at least 3 ferries a day from Koh Samui’s Big Buddha pier to Thongsala pier Seatran Discovery and Haad Rin Queen Ferry directly to Haad Rin. Boats also leave from Nathon pier (Songserm Express) and Mae Nam pier Lomprayah) to Thongsala 3 times a day. It is very easy to buy the ferry ticket at the airport, it usually includes also the shuttle bus from the airport to nearest pier. The cheapest way to take one of the overnight buses leaves Khao San Road (in Bangkok) evening about 18.00 and in the next morning arrives Sura Thani, then take a boat to Koh Phangan in the same way as above. Bus and boat combo ticket can be arranged by travel agencies on Khao San Road. Another option to get to the full moon party is by train. You hop on the train at the Hualamphong station in Bangkok and go overnight to Surat Thani. So you can see that the first option saves your time while the second one saves your budget. And both choices let us know that reaching to Koh Phangan still requires a bit of changing the transportation mean and also the time. 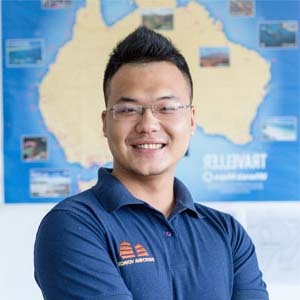 Meanwhile, being an expert in the area, Indochina Voyages can help you organize everything at a glance when you do not have to worry about the ferry schedule every day or how to get the flight with the better fare. 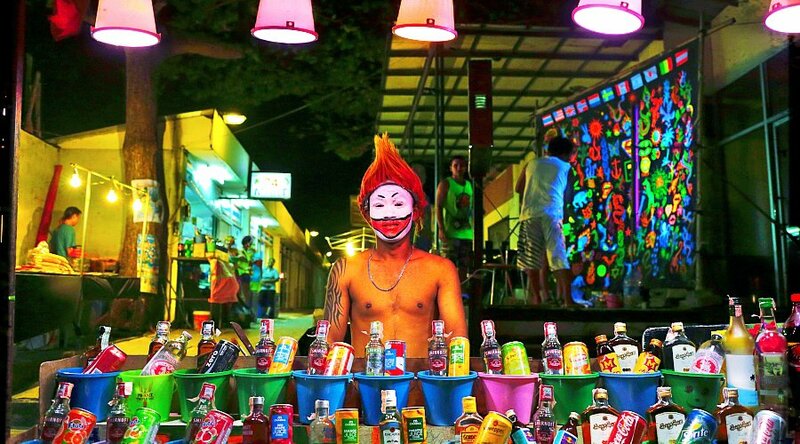 Talking about the uniqueness of Full moon party, it must the occasion when it is held every month throughout the year. The first Full Moon Party was improvised at a Paradise Bungalows on the beach in 1985, for giving thanks to about 30 travelers. The parties gained fame through word of mouth, and the event now draws a crowd of about 5,000–30,000 people every full moon evening. A highlight of almost every party is getting drunk, especially with one that takes place the whole night long. 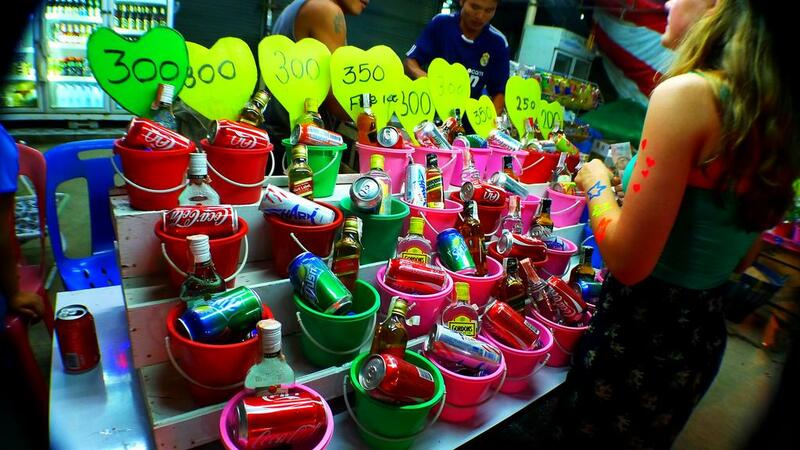 Thus from hundreds of street vendors near to the Haad Rin beach, you will see many colorful buckets (literal buckets in small size) filled up with different kind of drinks mostly alcohol, beer, coke, or Redbull made in Thailand and full of ice. 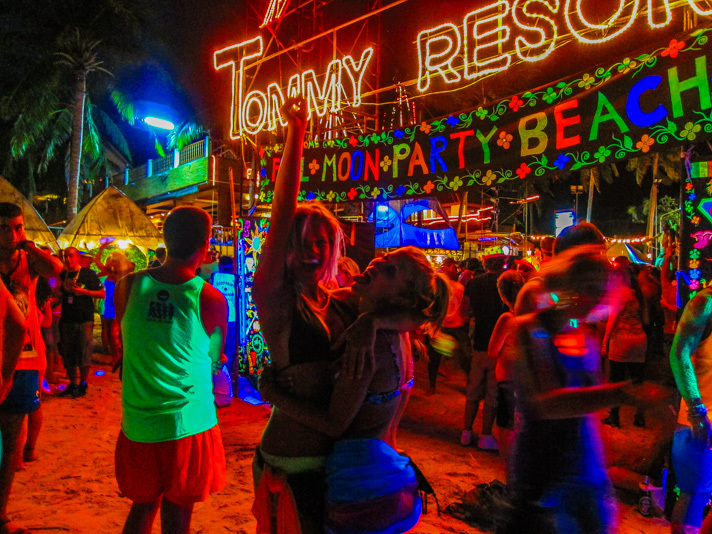 Do you think that Full moon party is the reason that a lot of travelers would love to try this island? I must say that it is true but not the main one. For those who are keen on beach relaxing especially the beautiful white sand with blueish water beaches, Koh Phangan is a great choice away from a quite touristy Koh Samui or Phuket. It only gets over crowded in the full moon day, while in the rest time of the month, it is still tranquil.